Markets could soon face a fall of up to 60 percent, two experts told CNBC on Wednesday. A jolt to international confidence in central banks will lead to a 30 to 60 percent market decline, David Tice, president of Tice Capital and founder of the Prudent Bear Fund, told CNBC's "Power Lunch." When this happens, he said, markets will face a "period of extreme turmoil." This crash will be precipitated, he said, by a disillusionment with the Federal Reserve's "confidence game," which will then see inflation rise, and the Fed scramble to raise rates. At that point, Tice added, "the Fed starts to lose control." Another market watcher also called for an impending fall. The Fed's low interest rates could bring a "scary" 50-60 percent market correction, said technical analyst Abigail Doolittle. "Unfortunately, I think it could come on a crash similar to what happened in 2007," Doolittle, the founder of Peak Theories Research, said on "Squawk Box" a day after the S&P 500 closed above the 2,000 level for the first time ever. "It's tough to know what the exact catalyst will be. But that's the very nature of that kind of selloff. They start slowly and then happen very suddenly." Doolittle pointed to a 20-year chart of the Dow Jones Industrial Average. "When we take the long-term chart of the Dow ... we see that it's trading in a multiyear trading range, hitting up on resistance. … What makes this so important [is] you can see that the entire bull market trend over the past five years has started to reverse." "When you see that kind of gyration around the trend, typically it suggests you're going to see some severe volatility," she said. "As scary as it is, I think that we could see possibly a 50 percent or 60 percent correction—an equal and opposite reaction to all these unusual policy moves." Doolittle called Tuesday's S&P 2,000 close a psychological milestone that means very little technically. "As high as these stocks markets go, I've become bearish because the underlying technicals from the long-term really support this view." "It's easiest to identify on the Russell 2000," she said. "What makes it important is the range has started to reverse the QE3 uptrend. This happened around the QE2 and the QE1 uptrend. ... 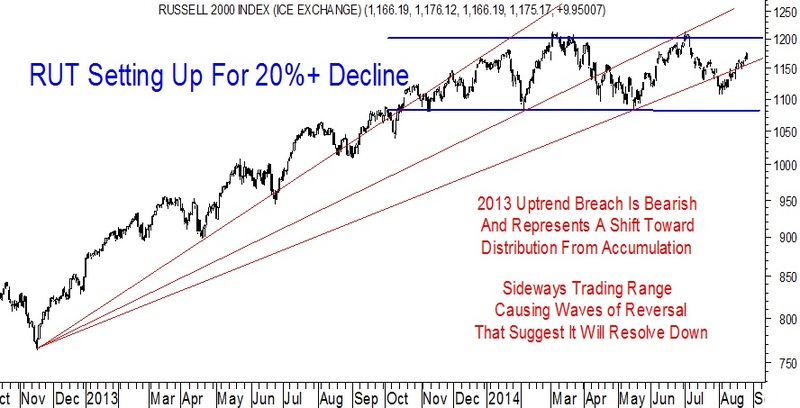 The gyrations [again] typically signal a correction is coming." It is important to note other market watchers have entirely different viewpoints. Just this week, Wharton professor Jeremy Siegel, for instance, reiterated his prediction that the current bull market will last through the end of the year.